When people first arrived in New Zealand around 700 years ago, they brought their dogs (Canis familiaris) with them. To investigate the introduction and dispersal of dogs across the country we generated twenty-three new complete, or nearly complete, mitogenomes from ancient DNA from dog teeth sampled from four early archaeological sites in New Zealand and from one archaeological site in the southern Cook Islands. When considered together with fourteen previously reported mitogenomes from the New Zealand colonisation era site of Wairau Bar these sequences reveal a striking lack of mitochondrial genetic diversity in early New Zealand dogs. Our analysis shows that a group of closely-related dogs were brought to New Zealand, probably from an East Polynesian source population, and that these dogs and their offspring were widely dispersed throughout the country during the colonisation process. This pattern is consistent with the current model of rapid colonisation of New Zealand undertaken by highly mobile groups of people. 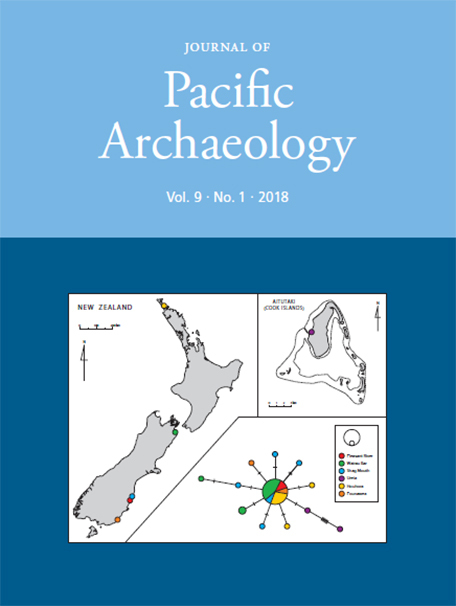 Greig, K., Boocock, J., Allen, M., Walter, R. and Matisoo-Smith, E. (2018) “Ancient DNA evidence for the introduction and dispersal of dogs in New Zealand”, Journal of Pacific Archaeology, 9(1), pp. 1-10. Available at: https://www.pacificarchaeology.org/index.php/journal/article/view/219 (Accessed: 22April2019).